Winter season augurs well for experimenting with new recipes. Here are four recipes from High Times for cannabis drinks, to add cheer to your Christmas holidays. Whether you’re interested in replacing alcohol or just supplementing it, these cannabis cocktails use a variety of infusion methods to blend with several different warm drinks full of spicy winter flavors. All of these drinks will elevate your mood while helping cozy vibrations spread through your body. Invite your friends over for a holiday party they’re sure to forget, after they’ve had one or two of these cannabis cocktails! Cream-based drinks such as Egg Nug necessitate making an infusion in order to integrate the cannabis into your cocktail. Simply add 1 or 2 teaspoons of already decarboxylated hash (I like ice hash or kief) to a Crock Pot along with a pint of heavy cream and set to high for 1 hour, then turn down to low for an additional 1 or 2 hours. You can strain it, but I usually leave the hash in there since it adds such a nice toasty, earthy flavor. 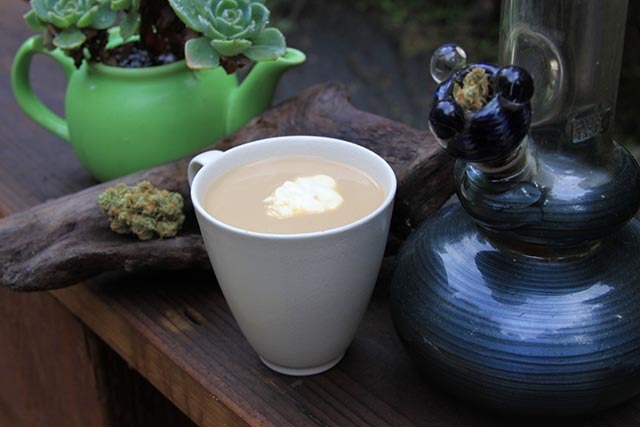 Cannabis-infused cream can also be used to makeHash Hot Chocolate, which is divine with a splash of whiskey. Adding tincture or medicated honey to tea or juice-based concoctions such as our Winter Punch will deliver a relaxing THC dose without the added calories from using cream. A note on mixing alcohol and cannabis: Unless you are extremely experienced with ingesting both cannabis and alcohol, don’t combine them. If you are a novice at eating edibles, pick just one or the other, and stick with it for the evening. If you consume both, the booze will still hit you quickly, but the cannabis will take an hour or more to effect you. The effects of each substance can be magnified when mixed together, so consume fewer drinks and be sure to drink plenty of water too. Party responsibly! This winter spiced mulled cider has been enhanced with “muggles,” which is an old jazz term for marijuana. Add the cider, juice, spices, sugar and peel to a medium saucepan and bring to a boil. Reduce heat to medium-low and simmer for 30 minutes to blend flavors. Strain the cider to remove the whole spices. Add the tincture and/or the booze. (Or not.) Divide into four mugs and sip contently around a fire. Alternatively, you could just as easily divide the cider, and then dose it with tincture or booze depending on individual preference. Cheers! 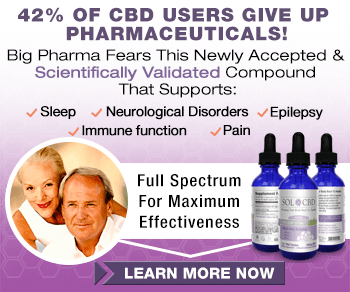 If using a tincture with 150 milligrams of THC and 60 mg of CBD, each serving would contain 37.5 mg of THC and 15 mg of CBD. 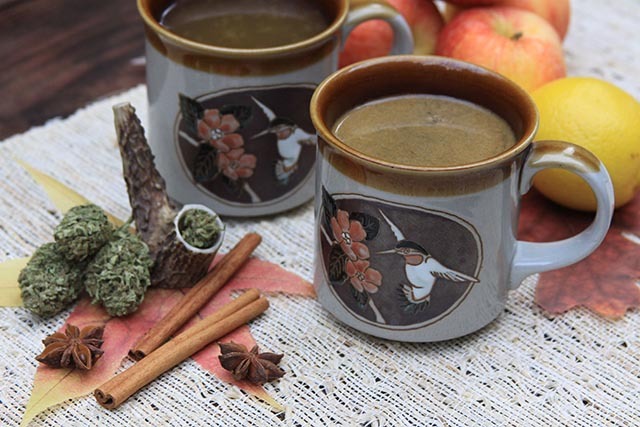 A slight cannabis twist on a favorite wintry weather drink, this hot pot buttered rum is perfect for coming inside and warming up after a day snowboarding or shoveling the driveway. Be sure to know the potency of your cannabutter to determine your desired dose. I used cannabuttercontaining 9.58 mg of THC per gram, so I was able to calculate that there’s 135.8 milligrams of THC in one tablespoon. Divided among four servings, that’s a dose of about 34 mg per person. Based on the strength of your cannabutter, you can use more or less. Bring water, butters, sugar, spices and salt to a boil in a medium saucepan over medium-high heat. Reduce heat and simmer, stirring occasionally, for 10 minutes. Remove from heat and stir in the rum, if using. Serve hot, and accompany with a fat joint. Named for the iconic pothead in the cult classic The Big Lebowski, the Dude loves bowling, smoking herb and drinking a combo of Kahlua, milk and vodka. We warmed up the Dude’s classic White Russian with the addition of some caffeine and cannabis cream for a high-octane hippie speedball. Perfect for a night of adventure, mystery and rolling gutter balls! In a medium saucepan, stir together the coffee, cannabis cream, Kahula and vodka over medium heat until thoroughly warmed. Divide among four mugs and stay mellow! 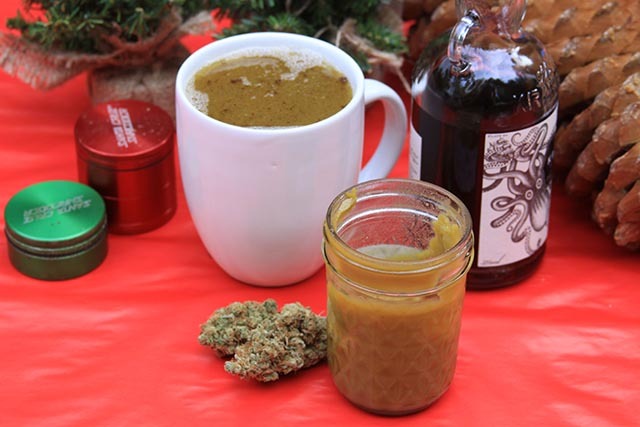 Similar to a hot toddy, this warm winter drink uses medicated honey to deliver THC. Steep the tea bags in 3 1/2 cups of hot water for 5 minutes. 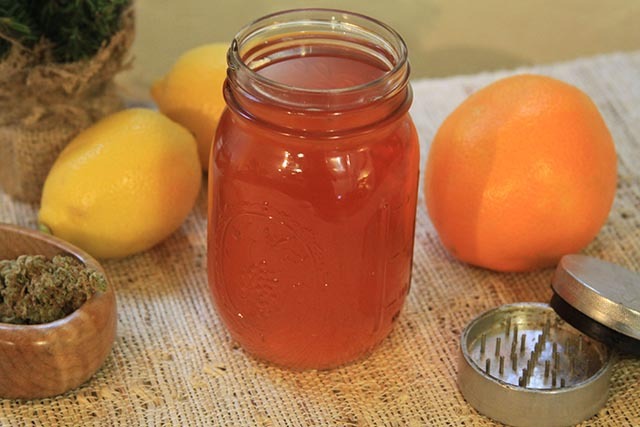 Remove the tea bag and add the rum, lemon juice, medicated honey and stir to combine. Divide into four mugs for a 10 milligram dose of THC for each person.